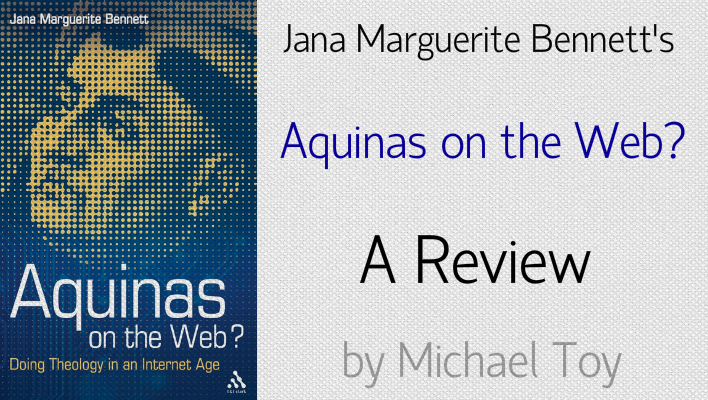 Jana Marguerite Bennett, Aquinas on the Web? Doing Theology in an Internet Age, New York: T&T Clark, 2012, 200 pages, $37.20. Like Jesus’ critics who wondered, “Can anything good come out of Galilee?” I often wonder, “Can anything good come out of Ohio?” But a recent book, Aquinas on the Web? Doing Theology in an Internet Age, by Jana Marguerite Bennett, associate professor of Religious Studies at University of Dayton, proves my skepticism wrong. Bennett’s work is the best work on theology in an internet age I have yet encountered. Her writing is lucid, clear, and well thought out. Her stated goal is not to provide a comprehensive overview of all the scholarship out there on media and religion, but she hits most of the major media theorists who write on Christianity in the media age. Additionally, Bennett has proven herself a savvy navigator of the medium she is studying by referencing blog posts and Youtube videos. 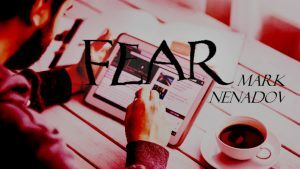 Furthermore, she dared to enter into the virtual reality world of SecondLife as well as into the dangerous area of reading the online comments on blogs and videos, a domain I rarely dare to tread. Her theological scholarship is impressive. She brings Aquinas’s methodology, John Howard Yoder’s theology of principalities and powers, and a rich knowledge of theology into the conversations of Christian media commentators such as Susan Wise Bauer, Shane Hipps, and Elizabeth Drescher in this impressive monograph. Her primary thesis “is that these different means of doing theology (offline and online) need each other in order to speak rightly about God and the Christian life” (2). In six chapters spanning 174 pages, Bennett argues in a successful way that the “online” life is as much a reality as the “offline” life. If we want to follow Christ wholly, we must follow him online as well as offline. We must not be blind to the biases of the medium but maximize the good that is there and minimize the bad. The book starts by arguing that theological conversations are already on the internet, but as of late there have been very few theologians interested in writing about the internet itself. The second chapter presents the internet as part of this material world, and as such, capable of redemption alongside all of creation. Chapter three tackles theological anthropology, or as Bennett calls it, theological cyborgology, building on McLuhan’s claim that when one uses technology it becomes an extension of oneself. The fourth chapter addresses the question of authority. Does the internet destabilize traditional religious authority? Bennett looks at the structure of the internet, the way authority is granted in this “democratic” medium, and the online Christian community. Chapter five addresses online communities, and chapter six moves into ethics, the issue of Christian behavior online. The command to love God and neighbor does not end when one enters the digital world. Bennett challenges readers to think critically and theologically about how one can maintain a Christian identity and ethic in the expanse of the internet. This book’s scope is limited to the internet and online interactions. A next step from this work would be an examination of digital life in a broader sense, encompassing the ubiquity of smartphones and the digital-interconnectedness in 21st century culture. Additionally, a next step would be an examination of ecumenical implications with new lines of digital communication opening into developing countries. This book, while addressing intra-religious dialogue between Christians, also opens the doors to thinking about inter-religious dialogue. Altogether, the book delivers exactly what it promises. Bennett pulls online and offline methods and content together in this work, opening up a conversation that desperately needs to be addressed in both the ecclesial and academic spheres. Bennett has done an excellent job sifting through the research on media studies, integrating it with her perspective on the Christian life. 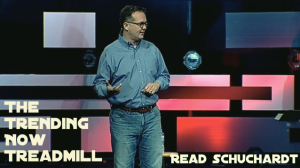 The resources that I have encountered before this work have either lacked academic rigor, feeling overly watered down for pastors or church leaders, or so highly technical and focused as to be irrelevant to the common lay person. This book is accessible to educated lay people, theologians, and communication scholars alike in a way the market has yet to see.